I came across Animoto twice in the last two days – once in .Net magazine and the second time when Brian Kelly used it to summarise a workshop session in the CETIS conference. This seemed to be enough for me to have a go. The approach is to provide a series of images and some music and let their software do its job. I think we are going to see a lot of these in the next few months. Here is my attempt using OpenLearn2007 images and some Creative Commons licenced music. Hmm – embedding does not work at the moment, I need to find out what the trick is to do that. In the meantime here is a link to the video. Update: I have now fixed the embedding using the video embedding tool provided at http://vodpod.com/wordpress – I have put the resulting embedded video in a separate post. The feedback session chaired by Adam Cooper (who is now an Assistant Director of CETIS). This was a quick run round around with slides (including a neat animated one from Brian Kelly). I guess that these are going to be available via the CETIS conference site. Mark Stiles then gave a fairly short final presentation. Mark felt that most of the issues we were talking about began with C –hence his title time for a C change. His background section raised the view that the VLE was causing its own problems when the reaction to web2.0 being to add a module to deal with each new feature. This is not the right thing to do. He then led into a talk organised as questions. The first batch looked at the way the new technology tries to control: but why should we do this? and actually is it not better if there were separate independent groups created by learners themselves. For me this was a good point – I am very keen on building up a space to support the learners on OpenLearn but the most straightforward way to do this is controling. A better concept is that we are providing models for how users might interact with each other. Mark then moved on to freedom v control in terms of how institutions react. At one level the fundamental position of “What are we selling?” as universities has yet to be properly addressed. He showed some work he had carried out using a simple interactive grid in Flash about where control lies across institution, tutor and learner initiation of action. The talk ended with a suggestion to visit their work on facebook, Not sure I got the right url but URL is http://staffs.facebook.com/group.php?gid=6572643972 and going on facebook and searching for elearning models seems to give the right sort of information. The first question followed from the observation that what we teach might be concepts – but what we learn is not concepts. Learning cannot easily be expressed semantically. E.g. how to represent the subtlety in a book (such as The Wizard of Oz) and model it. David answered that the semantic web is about machines and people exchanging information rather than describing everything. Simon added that e.g. what a student knows can be modelled just not completely. Diagrammatic representations help people think. Martin described his software follows lots of metadata standards – why should he move up to RDF or Knowledge Mapping? What does it integrate with? The answer was not entirely convincing as David said interoperability comes with common syntax anyway. So semantics is not about interoperability itself but across many systems. Allows exchange of data and of schemas – so what is the advantage in that? A potential use is to do automatic mapping of the data. Simon: The vision of semantic web is of an interoperable web – but actually more likely to be many semantic webs (this view was endorsed by Alistair) Simon also referred to http://www.si.umich.edu/InfrastructureWorkshop/ as an explanation for the background to designing infrastructures. Alistair said that adopting RDF to make things easier. Simon referred back to “the tragedy of the commons”, semantic approach would be adopted if this actually solved a problem. Lorna felt that teachers do hold on to their craft and so it is difficult to say that a commons is the solution. John Norman said that this was just an issue of time. Michael – there is a bigger picture for why we want to do this. He felt that the approach (and also agents, natural language) can build real services. John pointed we not be trying to answer how can we push a technology down people’s throats. Should be working on trying to help people. E.g. how to help describe subjects or create new research areas – needs building vocabularies and spotting links. Solve problems and use semantic coding in the background. Tore: a bit worried about a problem based approach. The technology is good at some things – e.g split off training (XML can do that) but learning needs the communication and sense-making aspects that this technology can support. eLearning perspective – JISC might need to fund to fund a development of tools through the teaching and learning programme. Lou MacGill suggested that the open rolling call mentioned in the plenary session may allow this but that there may lso be a need for a clearer planned role for connections with subject centre. Semantic web appear server to server communication. Change in way to produce data – public information. Semantic web actually pushes against commercial drivers so public funding might be used. My question on whether we should all need to worry about such things as RDF – the answer is that automation is being addressed. A follow up question was that JISC should build some use cases, a comment on this was we should also look for what is amazing about the semantic web. David felt some of the existing pie in the sky examples were not so useful but instead what is the next incremental step. One possible distinction would be teacher v learner support. After further discussion Simon came up with the idea of viral semantics that would spread in current environments something extra will happen. The end messages selected from the session both came from Simon: his Compendium map and the concept of viral semantics. Though I think Lorna had some reservations about how the analogy would work if CETIS were to then be the means of spreading the virus! Mikeal Nilsson http://mikaelnilsson.blogspot.com/2007/11/position-paper-on-semantic-technologies.html introduced a few more acronyms – SPARQL, GRDDL – these are trying to make things easier but do run the risk of confusing me more. His lead ppoint though was that the semantic web is just well designed web presence where you can “follow your nose”. He was asked if this was a push to a backstage approach rather than concentrating. This prompted me to mention Erik’s work. How does web2.0 relate to semantic web? 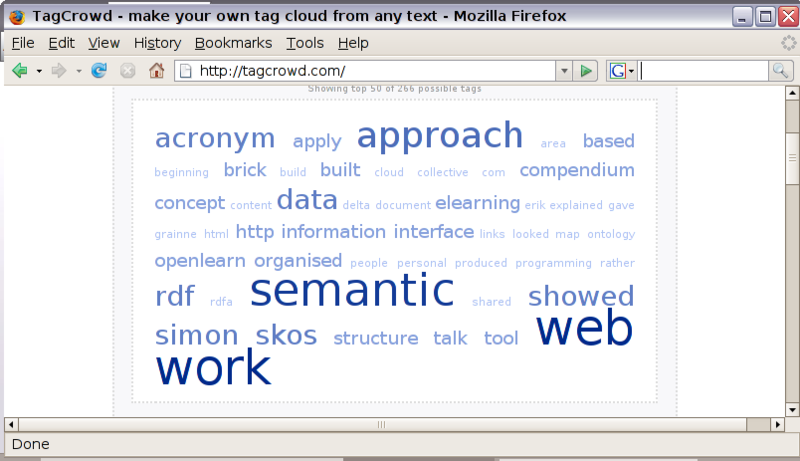 SKOS could be the bridge between the informal world of tags and the formal ontology based work. Why has uptake been slow? Only just now beginning to understand how to apply this he drew an anology with programming but I am not sure it works as I feel that programming has become a niche and specialist activity and we need wider take up than that. DELTA based on the earlier work for JISC on practitioner support. They built an ontology for subject areas by importing from Wikipedia’s OAI interface. ResourceBrowser – which was a hybrid between information about people in a social network and then connect to DELTA organised resources. His third example uses a combination of natural language and document structure to find personal information – and then demonstrate this through 3d interface built with Sun’s darkstar/wonderland. The e.g. was that a record collection could appear as 3d cloud. Lorna made the comment about how interesting it would be to see a concept map of all the documents of her machine. The clouds of words produced by perhaps show an indication of this. I will add one as a picture of this session! Explained how his work built on how to give compelling learning experience to users and if semantic approach helps that happen then good. Simon’s approach is to focus on interpretations as a layer above the semantic web. His work of course has a deep basis and he showed Compendium (availabe via OpenLearn). Simon’s make great personal use of compendium and so was able to show his map of the discussion so far. He also showed Grainne’s LD compendium mao. A bit that I had not seen was his memetic work on modelling meetings in the access grid. Simon also showed the soon to launch cohere based web tool. This could offer an impressive interface for building conceptual links. presented a computer centre view via UCISA. He started by saying the computer services has moved on and can even spell two point nought (I was told a while ago that shows you are outside the loop and two point oh is essential to show you are with it!). This led into discussion of what UCISA achieves and how it works for the members with a close look at concerns via a – top concerns survey. Aparently available via their website. – just checked it is at http://www.ucisa.ac.uk/activities/surveys/tc/2007/tc2007_results.pdf . Leading to 28 issues and ranking via the web – effectively a delphi approach by the sounds of it. The ranking and changes over time were then described. Iain apologised several times for the powerpoint and colours used. Funding came in at #1 and eLearning at #3. The rise of eLearning indicates how much more that is being spent of these in institutions and the change from systems off every Wednesday afternoon to running open access labs on Christmas. An emerging issue was green computing – apparently there is a league table of that (just looked and the OU is absent from the table – not an unusual aspect of tables). Iain also noted that social computing had not managed to make it to the top 20 – it might now! Sarah Porter is now Head of Development of JISC. Her starting theme was innovation, kicking off with the Wikipedia definition and explaining how JISC programmes such as looking at the learner experience feed into innovation. Sarah showed an interesting graph showing how the introductionof fees has changed both the numbers and the profile of students. So in the future there will be less students and they will be richer. The question then is how to reach those who are now excluded – this made me wonder if open content and open education have a role? Sarah also talked about Rogers/Moores innovation model and the Ventraman MIT mdoel of transformation. That model suggests that the transformation layer to connect bottom up (practice and experimentation) and top down (strategy and policy) initiatives. As Sarah said this is not new – but HE is a complex distributed system and so this is not easy! JISC’s own place in this was shown through their eLerarning programme and some examples – ‘In their own words’ (which included a quote from Grainne’s report), SCORM player from Icodeon, Diana’s pedgogy planner, and RELOAD, Leadin into some of the more strategic – CAMLE, XCRI. Sarah ended byflagging a book called ‘The e-revolution and post-compulsory education’ from Routledge (possibly authored by Peter Ford). JISC e-Framework got a final mention as something to be seen as outlining ways to connect rather than something to be filled in. An attractive description for our own role was that we should all be secret agents to push for change as indivividuals – while also joining communities of practice and increasing our profile (not sure that is entirely consisten!). Questions were about the role of the discipline in crossing over the connections between institutions with subject centres playing a role. I am at the JISC CETIS conference and following the success of blogging at the OpenLearn2007 conference am having another go starting with Oleg’s opening talk. Oleg Liber is kicking off the conference with a look at the changes that have happened from no computers in everyday learning to now having broadband in every cottage. But he has just presented an analogy that involves slowly boiling a frog! Apparently the frog will not leap out if the increase in temperature is gradual enough. Are we being boiled to death by the slow (or not so slow) heat of technology? Despite his comments about institutions being boiled to death – Oleg was suggesting that we should not be afraid of change. His first example was about the opening up of content – linking through to validation, tools and the way people work at a personal level. Interesting from the OpenLearn point of view was his description of the world of free content v the internal formal repositories. He used the term an “ecology of content repositories”, which of course resonates with John Seely Brown’s ecosystem presented at OpenLearn2007. Oleg raised a big question of “Do we need universities?”. His quotes were from Illich (1976) about the couterproductive fight for survival of institutions as opposed to the change in how they can be viewed as there for the user. He ended his introduction by asking us to think about our view, our achievements for this year, and what we should seek to achieve this year? The afternoon groups will all cover different points he touched on. He described how each group will produce one slide (one sentence and one picture) as a result that should be uploded as a google doc. Sounds like an efficient way to get a summary! As a link through to Sarah Porter from JISC he mentioned has launched a rolling call on supporting innovation.